As the Manchester Literature Festival nears the end, I thought I couldn’t be further impressed or surprised by the events. Little did I know that Imtiaz Dharker’s collaboration with Manchester Art Gallery would stun me and revolutionise the way we read and discuss poetry. On my journey to the event, I did find it a little odd that a literary reading would take place in an art gallery, but I didn’t give it further thought until I reached the venue. Upon entering the exhibition room, the setting was unlike any other reading event I had attended. The lighting was dim, there were no chairs in sight and the poet/artist Imtiaz Dharker wasn’t hidden away in a red room. Instead, Dharker invited the standing audience to unfold the stacked seats and form a circle around her. There was little distance between the writer and the audience which created an intimate atmosphere with the dimmed lighting. The curator warmly introduced Dharker and explained that Imtiaz’s poetry was in response to solo exhibitions from South Asian artists Neha Choski, Risham Syed, Mehreen Murtaza, Waqas Khan and Hetain Patel. The exhibitions are part of the New North and South, an ambitious three-year programme of contemporary art celebrating the shared heritage of South Asia and the North of England. The curator continued to explain how the literary reading would unfold; firstly, Dharker would read three poems and then the audience would move through the art gallery to another exhibit where she would recite the remainder of her responses, followed by some of her other work. The curator then introduced Dharker. Born in Pakistan and raised in Scotland, Imtiaz Dharker is a poet and documentary film-maker. She has published several collections, including Purdah (1989), I speak for the devil (201), The terrorist at my table (2006) and, most recently, Over the Moon (2014). In recognition of her work, she was awarded the Queen’s Gold Medal for Poetry in 2014. Much of her poetry explores themes of identity and gender politics, geographical and cultural displacement, and the ramifications of the culture of purdah. Furthermore, Imtiaz is an accomplished artist, and her pen-and-ink drawings have been featured in ten solo exhibitions across the world, including India, Hong Kong and the UK. The curator marvels at Dharker’s ‘CV’ and the audience laughs. Dharker addresses the exhibition room we are in with the work of Lahore based artist Waqas Khan. She realised how sufi and minimal the work was, and admired the meditative quality of the artwork, which she mirrored in her short poem about dashes, lines and the movement of the hand. The curator explains the context of the room, and how Khan’s abstract drawings are made of tiny dots and dashes. In the minute yet large scale composition, the artist desired to put his contemplation down on paper in hopes the audience would in turn contemplate it. She further explained the meditative quality comes from the fact that the artist works at night, slowing down his breathing. The curator tells the audience earlier when discussing the work with Imtiaz, she saw a correlation between the works and Imtiaz’s own drawings. Dharker agrees, explaining she recognises the stroke of the hand, the pen, and she felt as if she knew how his hand moved. The next poem Imtiaz reads responds to the gallery next door, a multi-channel film installation by artist Neha Choski who is based between LA and Mumbai. Neha was particularly interested in the idea of what it was to be an individual and how we are all shaped by friends and family. Imtiaz saw Neha’s work as the images of lines between people, lines of communication and community. She then recites her poem which details lines, finger to heart, well to mouth, north to south and threads that connect people. Before Imtiaz performs her next poem, the curator expresses her happiness and the inclusion of writers, someone outside the field, to look upon the exhibition pieces. She describes how the responses formed by Dharker is not a literal relationship to the work, but a starting point which thrills the artists. The curator then briefly explains the context of the next poem; A group of artists based in Karachi called the Tentative Collective. They have an interest in the urban metropolitan city of Karachi and are very politically engaged. Their project was not a gallery exhibit but rather a performance. Unfortunately, they were not granted their visas by the British Government and their performance was cancelled. As the artists were upset, the group created an intervention for the gallery, an art work that uses their visa rejection letters. The curator instructs the crowd to make their way to the next gallery. As the flock moved toward the next exhibit, I couldn’t help think how strange an idea it was to move an audience when they have been engrossed in a reading. It wasn’t until we moved to our next location that I realised the innovative idea was a success. Along the way, I noticed the beautiful gold framed paintings and the change in atmosphere with bright lighting. As there was no stage or microphone placed in the Victorian drama gallery, the intimacy between the writer and audience still prevailed. To my amusement, the people already there viewing the exhibition looked confused but curious at the approaching mass of people, and when they heard Imtiaz read they strayed from gazing at the paintings to join the audience and hear her work. The curator notifies the audience of the surrounding work by the artist Risham Syed. Her solo exhibition is known for her post card sized paintings of Lahore (where she is based). She depicts the landscape and the ever-changing construction occurring in Pakistan. She feels she doesn’t recognise her home town sometimes, and the fact they are postcards transformed traditional tourist views of postcards. Risham’s work depicts middle class houses being built, the front a beautiful façade, but the back wall is unfished as it is a private area. Imtiaz responds to Risham’s work with a poem entitled “Send This.” Her poem interestingly contradicts the title as she starts the poem by stating “Don’t send me a post card of the city that once lived here.” The poetic persona continues to describe how a photograph will never capture the essence of the city that was long gone. The next exhibition addressed by Imtiaz Dharker is by British artist Hetain Patel. The piece works with concept and idea of Spiderman as when Hetain was younger, he felt his Spiderman costume covered every inch of his skin and he became “Not the Asian Spiderman, just Spiderman.” The curator continues by telling us Hetain interrogates stereotypes of identity and does it in humorous way as we are laughing with him. She explains the setup of the piece; a Double screen projection, one side a flat screen with spider man leaping through air, cinematic as the jump is slowed down to six minutes long with Hollywood music. The other side of the screen reveals Patel in his grandmother’s living room, dressed as Spiderman, jumping from his grandmother’s sofa onto the floor and his family, dressed in their beautiful Indian garments surround him. Dharker responds by telling the audience she loves the Spiderman films and hopes her poem entitled “The Jump” will portray her love for it. The poem describes a motherly poetic persona watching her child leap, dressed as Spiderman with webbed skin. As the speaker urges the child to join the family and relatives for food, the child ignores the call. The poem beautifully describes the world as the carpet as the child leaps over “Bolton, Leister, Brent, New York.” The ending of the poem is chilling as the audience members “oohh” at the line “He is strange beautiful and no longer mine.” Dharker’s response to the Spiderman theme was my favourite poem from the collaboration with the art gallery exhibitions as it was vivid and striking. The final poem of the exhibition is inspired by the work of the artist Mehreen Murtaza. A Lahore based artist who created a garden for her exhibition entitled How You Will Conduct Yourself in the Presence of Trees. The piece is immersive as the sounds come from the electromagnetic field around the plants and is affected by the presence of mobile phones. Dharker recites her comedic poem about garden gnomes on their phone, with reference to the watching Games of Thrones, which the audience can’t help but laugh at. Imtiaz then reads her own poetry. She tells the audience she used to live in Bombay, now called Mumbai and during her time there filming a documentary for unicef, she saw a welcome accident unfold as the main’s water pipe burst. Her poem “Blessing” describes the “skin cracking like a pod” and the poetic persona’s gratitude for the refreshing water. The next poem was written (my favourite poem of the event as it struck me the most) in response to an honour killing that occurred last year in Lahore, Pakistan. A woman was shot by her family in her lawyer’s office as her crime was as she asked for a divorce. At the time the Pakistani senate refused to condemn the act as they called it an “Honour Killing”, the poem’s title. 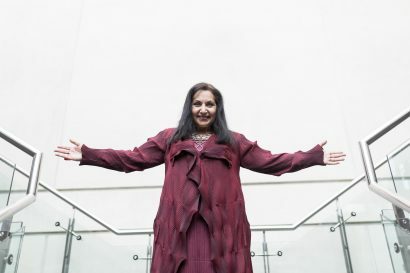 The poem was striking as Imtiaz describes a woman who takes off “a coat, a black of a country.” As the poem escalates, Dharker uses hand gestures to remove “the veil” of the poetic persona. The poetic persona continues to remove garments and part of her body. When Imtiaz finishes, audible ‘wows’ are heard amongst the audience, and I too share the sentiment of wonder and amazement at her poetic talent. The curator thanks Dharker for the poems and informs her before the event, she only had the pleasure of reading the poetry. Now, however, hearing them aloud, she poses Imtiaz with the question of the difference between the public and private, writing and performing the work. Dharker responds “the moment the work is published, the moment it goes to the public space it has a right to be heard.” The next question concerns drawing on inspiration other than commissions. Dharker tells the curator though the writer is locked away in a quiet room, inspiration is drawn from being out in the world, railway stations, hearing bits of conversation. The curator was curious about Dharker’s relationship to geographies as she was born in Pakistan and grew up in Glasgow. She asks if Imtiaz is aware of the influences of location in her work, and Dharker responds: “It’s something that you grow up with. The lullabies your grandmother would sing, the taste of the food. They somehow seep into the poems, but that’s not just me that’s all of us.” The curator unpicks the poetic process and notes Dharker use the world ‘release’ in relation to her poetry. She asks if her poems are there waiting to be unlocked. The crowd laughs when Dharker replies “I wish!”, “It’s a lot of cutting and getting down to the bone.” In relation to Dharker’s economy of style and chopping of words, the curator asks when Imtiaz knows her poetry is finished. Again, Dharker makes the audience laugh with her witty remark “Ask my publisher!”. Before the curator opens the questions to the audience, she poses her final question about Dharker’s choice of diction in relation to her poem “The Right Word.” She wonders if it was Imtiaz’s intention to make people aware of the diction they employ. Dharker’s strong response “Words can kill.” exemplifies her prominence as a poet as she notes words can wage wars. The audience are eager to question Dharker. The first question she is asked concerns her writing process. When she writes her half-a line, does she have an inclination as to where the poem is going? Dharker responds she works the poem around themes, she doesn’t know where it may be heading but it feeds into a preoccupation she may be having at the time. The next question concerns gender and politics. Dharker is asked, as a woman, does she desire a particular group of people to read her work and to change things politically? Imtiaz responds by telling the audience all she can do is write the poems, she believes everything is political, “breathing is political” yet all she can do is write and hope people come to her work with an open mind. The next question regards Dharker’s process of writing once more, questioning if she makes a note of the idea or is her inspiration stored in her memory. She tells the audience it has to be written down with her bad memory. The next question concerns how much thought does Imtiaz put into the final print of poem. Dharker responds “every poem has to look good on the page, it has to have the right shape or it will look undisciplined”. The next question posed brings back a lovely nostalgic memory for Dharker. The audience member recalls Dharker’s performance by candlelit (accidently when the lights went out) and the question asked is if the location of the reading is important to her. Imtiaz thinks fondly of the reading and tells the audience for today’s event she had a choice between reading in the auditorium and the exhibitions pieces. She chose to be by the art as it gave weight to her readings. The following question shows the audience absorbing Dharker’s every word, as the audience member notes Imtiaz personify her poems, saying they ‘misbehave’ and the question asked is does she see her poems as subjects. Dharker didn’t realise she gave her poems a life until it had been pointed out to her, but she does see them as subjects as she talks about her poems and taking them out for a walk. She feels she has conversations with a line and at times she will fight with the poems. The last question of the event is curious, about how much Imtiaz had to immerse herself in the artworks to come up with poetry. Dharker responds by informing the audience she looked at what the artists were aiming for but treated the artwork as if it became hers. The event ends with Dharker reading a final poem entitled “Hiraeth, old Bombay”. Hiraeth is an old untranslatable Welsh word meaning something in the direction of a longing to return to something that is no longer there. Imtiaz refers to Bombay once more, a city whose name has been changed. The poetic persona in the poem reflects on the old favourite spots of the city and the places they would have taken their loved one to visit. The exhibition is at Manchester Art Gallery until February 4. You can read Imtiaz’s Six Poems North and South on the MLF website.